Falooda is a popular dessert not only in Mumbai (Bombay) where it is thought to have originated but also in the rest of the country. This chilled drink-dessert is the perfect way to cool off in the summer heat. Cook the vermicelli as you would pasta - in boiling water until cooked al dente. Strain, and keep aside to cool. Then chill in refrigerator till needed. Cut into thin slivers a few almonds and pistachios - about 6 to 8 each. Keep aside to use as a garnish later. Put the milk, powdered sugar, remaining pistachios, and almonds in a blender, and blend until smooth. Chill in the refrigerator. Put the basil seeds in a bowl, and pour enough water over them to completely submerge. They will soon start to swell and look transparent with a small dot-like, black center. Strain, and keep aside in a small bowl. To assemble the shahi falooda, frost 2 tall glasses. In each glass, put half the vermicelli and half the pre-soaked Sabza seeds. Pour half the milk over them. Put just under half the rose syrup (keep a little for garnishing) in each glass, and mix well. Add a scoop of ice cream to this, and drizzle with some more rose syrup. 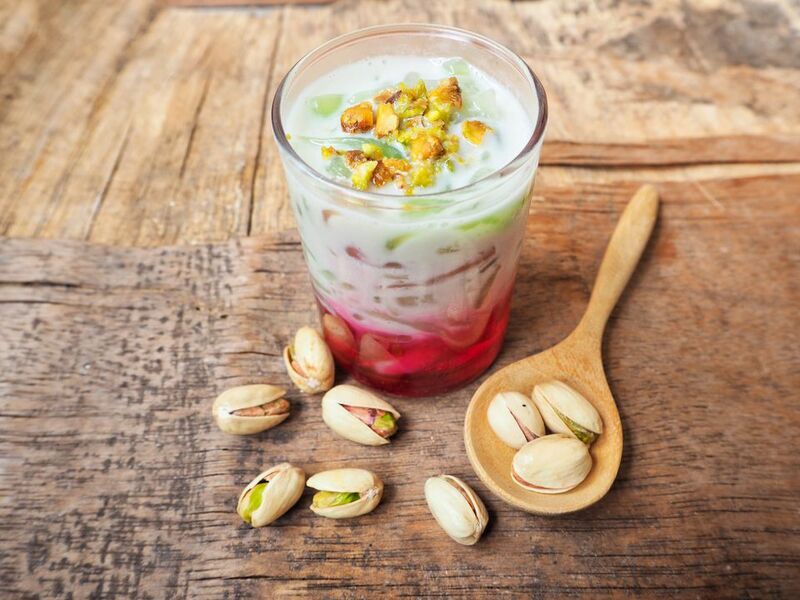 Garnish with slivered almonds and pistachios. Add a straw and long-handled spoon and serve!